The tulip magnolia (Magnolia liliiflora) may be my new favorite tree. I love the almost-tropical-looking blossoms and wish they could last longer. . . .
After the fall. . . . 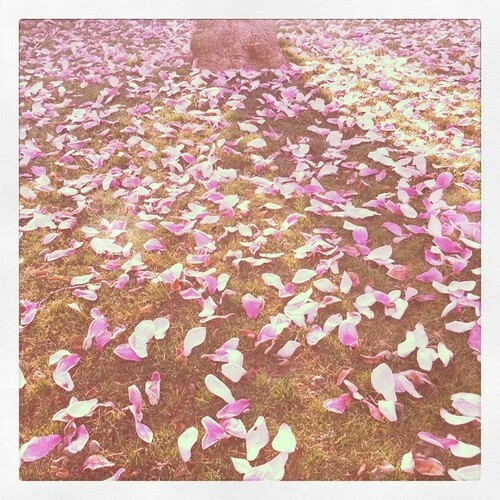 This entry was posted in photography and tagged Florabella action, Instagram, soft tones, sunlight, tulip magnolia blossoms. Bookmark the permalink. a carpet of pink and white… amazing! Yes, I wish that tree was in our yard. I love those trees. We have a lot around her but they are not ready yet. The first photo is like a delicate painting. I eagerly clicked on this link because I just bought two of them and we’re trying to figure out where they go. The ticket says they grow to 2 meters (over 7 feet I think). Does that sound about right? Yes, that sounds about right for tulip magnolia. Southern Magnolias (the traditional magnolia) get to 80 feet! 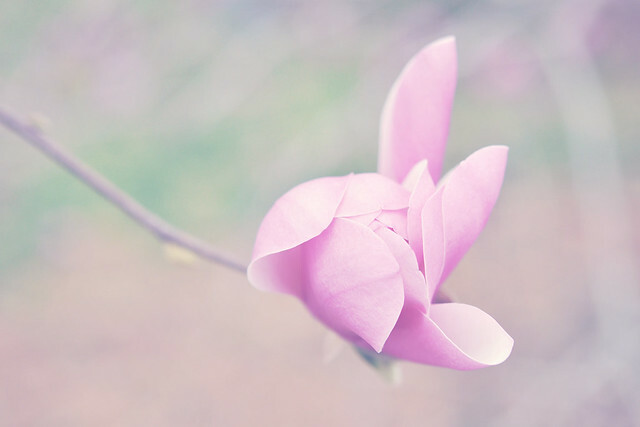 I don’t think I’ve seen a tulip magnolia before, but I love thinking about the combination – two of my favorite flowers. Tulip magnolias “can be seen at the New York Botanical Garden, which has an allée of mature tulip trees leading up to the library building.” Evidently, it’s too cold for traditional magnolias in NY. Thanks for the research! In that case I bet these are also at the Brooklyn Botanic Garden. I have a question for you: Would you happen to know what type of plant this is? It’s in bloom in one neighbor’s yard and I’ve never seen this unusual plant. I’ve never seen it before, Jackie, but the flowers remind me of Daphne or Viburnum, both of which smell really good. Sorry I can’t be more helpful. That gives me something to go on! Thanks so much. Yes beautiful photographs. I am imagining a bride in her beautiful dress standing in the middle of the second photo. Love the carpeting of petals! Thanks, Patti. I am enjoying instagram a lot.